I read somewhere that the Queen was furious that she smoked and told her she must give it up. Not sure if she did and just does it in private now. There are also rumours of pictures of her smoking when she was caught naked in France. Why would the Queen care whether or not Kate smoked? Margaret was never without a smoke. That was a long time ago when smoking was socially acceptable. It isn't now, especially if you are pregnant. Most people frown upon the habit because it is harmful to health for smokers and non-smokers and also looks very cheap and tacky. I don't know where you live but smoking in the UK is banned in every public place. I doubt the story of Liz telling K to quit smoking, too many Winds have and still smoke for that, makes little sense, esp as Liz doesn't really do much when it comes to family except bury her head in the sand. Also it was said that K was very careful to not be pictured smoking, I also remember stories of how she'd immediately light up after leaving a plane when they were on tour, deliberately going someplace where she wouldn't be as seen and not be photographed. Many stories of her smoking, just no pic. ^^ Which still has no bearing with the Queen being furious with Kate smoking. I doubt she'd care. Margaret had two healthy children while smoking; the Queen's father smoked; as HRH said, many people around her smoke. I'm pretty sure Philip did, at least years ago. Carole Middleton smoked but supposedly quit. I'd think she would encourage Kate to quit as well. I doubt Pippa smokes, as active as she was prior to the baby. If Margaret had not smoked so much, she probably would still be here today. Her father smoked too and died of cancer. Margaret was very sick towards the end of her life and in a wheelchair. The Queen may be horrified at seeing someone smoke because she lost two loved ones (and they both died at relatively young ages) from cancer and both were chain smokers. She shows up looking on the haggard side...and then suddenly, emerges again looking 25 again. Like here (BAFTA 2018). She looked quite gorgeous there but she was pregnant. Maybe it was the pregnancy weight but maybe it's fillers too. I suppose it's fillers when she is not pregnant and looking good. If yes, she should do them more often because they work on her. 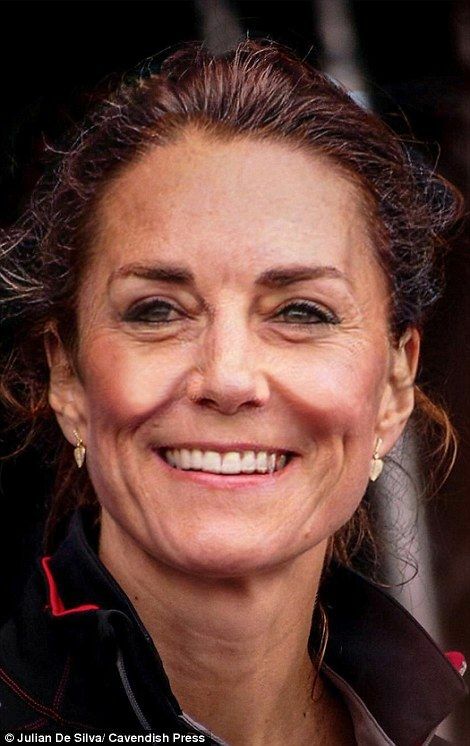 Kate's face looks rather skeletal now. If it gets too thin, it gets into Karen Carpenter territory which is frightening. She lost lots of weight in the face. If she continues to stay this thin, when 40's hit it will be Granny Town. ^^ What's up with this? Her face is deformed looking with all that puffing out and sagging along side her mouth and jowls! If someone is injecting filler into her face, they are doing a terrible job. ^^ She has definitely lost heaps of weight and it shows in the face and particularly the neck. Her neck looks similar to some middle-aged women. She did look healthy when she was pregnant and when she was not as thin in her uni days. The extremely thin look does not suit her as it makes her look a lot older. You would think that with how well she's taken care of, that she would look decades younger. You would think she would look younger,more carefree, and able to more effectively do duties by the dozen every day. she'll look like this when she get into her 40s but more wrinkles on the forehead. they photoshop her face a lot. I tend to think that Kate will look very much like her mother Carole in late middle age. She resembles Carole facially much more than Pippa does, who has a different shaped face. And just as Carole always looked around her age or older so will Kate. I think she will increase the Botox to a greater level though. I think KM looks nothing like her mother. Or father. Neither does Pippa look like any of her parents or siblings. The brother too looks like he's from some a completely different branch. In fact, I don't think I have ever seen a family where there is so little resemblance between all members. Also, her mother looks younger than her age. Well, we'll have to agree to disagree. Carole has thin lips, so does Kate. Since Kate has lost a lot of weight she and Carole have the same bone structure. And IMO Carole has never looked young or fresh faced, as photos from her 20s that have been online forever show. She's always had fairly bad skin and so has Kate. IMO. Maybe Kate looks like one of her relatives. I think Kate has some of Carole's characteristics. Charlotte certainly has Carole's looks and the photo of Louis at Christmas, IMO he has the Middleton look. Not all family members look have the same characteristics as their parents but can look like other relatives. My brother and I had my mother's eyes and mouth yet, my brother had no resemblance to my parents. My Pop (grandfather) used to say my brother was an image of his great uncle. (Apology for the off topic comment). There are pics (eg the recent ones of Carole where she gave her "first interview" or whatever it was called) where the resemblance between Carole and Kate is uncanny. I was looking at pics from ages ago of Kate and the resemblance to Carole was startling. Pippa has a bit of both her parents and, but Pip & Kate resemble mostly Carole and Carole's mother. Yeah Louis is a little a Kate and Char is so far a little Carole and George is mini Mike. Right down to the walk and how he carries himself. It's remarkable, but I have some such uncanny resemblances in my family too, it's kinda hilarious too. ^^ I agree, also all 3 Midd women (Car, K, P) have aged terribly. Carole's recent pics have also been heavily photoshopped, which is why she looked quite fresh faced in them. The 3 Midd siblings do have imo a great resemblance to each other, which is esp easy to see when looking at pics of James when he was beard-free. They mostly favour the Goldsmith line in looks. I think Kate is at a point where she has begun to show the strain that she subjected herself to. This might sound silly, but near the end of her life, Anne Boleyn was much the same way and I think a huge part of it is Kate's temperament and strain to compete all the time. Competing is good for the short term, but there has to be rest, a finish line and then relaxation. Regrettably Kate was not raised or trained to handle a life where her position requires her to be in a state of being always on campaign for the monarchy. Like being a politician's wife only there is no four to eight years of being able to enjoy oneself and be able to party and do ceremonial appearances, she is never able to relax. Like a lot of former mistresses, she still has to justify WHY William married her and not just to him, but to the nation and to the rest of the world. Each time she accomplishes a new milestone and wants to rest, each rest period she loses more ground. Each new maternity leave, she loses another year of press coverage and the chance to build up public affection. Each time she tries to be more proper she loses William's interest and I think each time she acts wild, she irritates the courtiers. She has inadvertently placed herself in a situation where she simply cannot win with the people she NEEDS as allies and even potential friends. Even her family won't help her out. They are relying on her for favors, but if she falls, all of them will disown her quicker than anything and she will end up alone. It's fascinating when you think that she thought that ring on her finger would solve all her problems. She thought that she would be safe from having to work, having to compete, and she would be able to rewrite her past and become a virginal English rose who was spending her twenties in training for her time in royal life, but that is a lie that will soon come through as well. She is still straining to relive years that are dead and gone and had been wasted and she can't just walk away from this. She is stuck with no chances and no allies and no connections and nothing is going to change that. I think the totality of her wasted life is also catching up with her and frankly that would also take a number on her looks. Throw in the decadent lifestyle and it should be clear that she set herself up for a premature aging process and I'm certain that she is at a breaking point. Given her vanity, I wager she is loathing the loss of her looks.